The centenarian who had undergone stenting as many as six times has been complaining of mild fever with the variant heartbeat on Wednesday night. 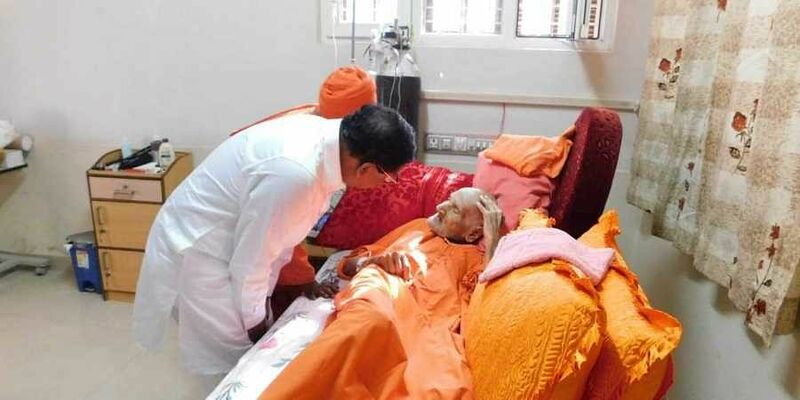 TUMAKURU: As there was a fluctuation in the health of the 111-year-old senior pontiff of Siddaganga Mutt Sri Shivakumara, the doctors' team headed by Dr Ravindra B S of BGS Gleneagles Global Hospitals in Kengeri had dropped in at the Mutt and took stock of the condition last night. On Thursday the doctors' team including Ravindra and Siddaganga Hospital and Research Centre's head Dr Parameshwarappa flew to Chennai to take a second opinion on the treatment by consulting liver transplant expert Dr Mohamed Rela who had previously performed a liver transplantation on a 5-day old baby. The doctors would also call on well-known gastroenterologist Dr C Palanivelu for his opinion as well. Speaking to TNIE over phone Dr Parameshwarappa clarified that a decision will be taken on shifting the Swamiji to the hospital from the mutt after a discussion following the experts' opinions by Thursday evening. The centenarian who had undergone stenting as many as six times, eleven stents involved of which three dropped, at the BGS Hospital, has been complaining of mild fever with the variant heartbeat on Wednesday night. He was subjected to certain medical tests and treated with medicines at his room following which he recovered. He had two button idlis and pomegranate juice and also performed 'shiva pooja' on his own, Mutt sources said. The junior pontiff Dr Siddalinga Swamiji clarified as the Swamiji's health is stable and the devotees need not worry about it as the experts have been treating him. " The devotees should wait for some more days for the darshan until he recovers fully", he said. The deputy chief minister Dr G Parameshwara, who was on a scheduled visit here, paid a flying visit to the mutt and exchanged the pleasantries on Thursday morning. " The Swamiji asked about my health and suggested to have the breakfast in the Mutt. He sought to know how old he is for which the junior Swamiji replied as 111 years old and inturn the centenarians awed as he is so much old", the DyCM briefed about his visit.